Nachdem Sie einen Tag im Glacier Park verbracht haben, kehren Sie zu einem schönen, entspannten Abend auf Ihrer Veranda mit Blick auf den malerischen Flathead River zurück. Grill, braten Marshmallows am Strand, unter den Sternen schlafen, während Sie 'der Fluss fließen'. Wilde Gänse, Enten, und Adler fliegen durch täglich. Zu Fuß entfernt befindet sich Restaurants, Souvenirläden, eine Taverne, Haar-Stylisten, Antiquitäten, und Lebensmittelgeschäft. Fisch direkt aus der Hinter, nichts wie frische Forellen zum Abendessen! Wenn Sie zu fischen und Hilfe benötigen, fragen Sie uns gerne, wir wissen alles über die Fischerei. Stichwort: Schönes Haus mit einem atemberaubenden Blick auf Great Northern und der wilden und malerischen Flathead River. Parkplatz für Motorschlitten. Schneemobil-Routen entlang der Hungry Horse Reservoir - 3 Meilen entfernt. Langlauf aus der Tür. Angeln ist 25 ft. Vom Haus entfernt. Setzen Sie Ihr Boot in den Fluss hinauf und schweben nach unten bis zum Haus. Touren mit Führer zur Verfügung. 4 Blocks entfernt ist der Hungry Horse Supermarkt, 3 Blocks zum Elkhorn Grill. Great location, great scenery and very convenient to GNP. The location was beautiful. The description of the property (356115) on VRBO is inaccurate. Twice in the overview, the property is described as a house. It is not a house, but is a downstairs apartment with a couple living in the house above the apartment. We were aware of a large fire on the west side of Glacier NP and emailed the owner Aug 20 to inquire as to whether the fire would affect our visit. The owner replied that the fire would not impact our visit. The fire did indeed impact our visit. The primary road through the park was closed, forcing us to drive approximately one hour additional each way to access the east side of the park. We were left with the impression that the owner was more interested in renting her apartment and less interested in the impact of the fire on our visit. Beautiful location, great facilities, we highly recommend. The river is beautiful, and the location is so serene. My husband and I spent the weekend of my 40th birthday at this beautiful property. We loved every minute of it! It is so peaceful and serene and in a GREAT location! We loved taking in the beautiful Flathead River (right out the front door) and listening to the trains, especially in the evening. Checking in/out was a piece of cake, and it had everything we needed! Thank you! We used this home as our base for the West Side of Glacier National Park. It was a short drive to West Glacier with little traffic. Nearby was a small well stocked grocery store. The photos accurately show the beautiful location of this apartment. We were able to walk down to the river and try fishing as the owner had a fishing pole with lures set up on our porch. Unfortunately, we did not catch dinner! 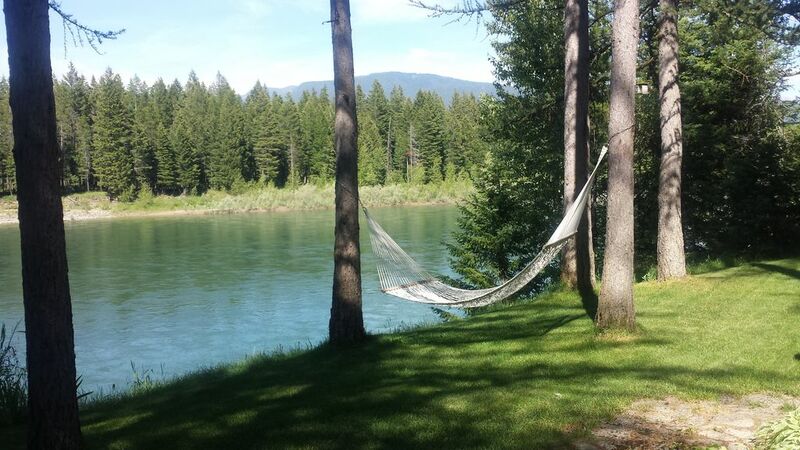 We enjoyed sitting on the porch or in the hammock watching an occasional raft float by. This is a very quite part of the river. Several deer came by with a young fawn. We also saw a bald eagle in the woods across from us. It was a perfect location to see the park but an unexpected highlight in the area was Hungry Horse Reservoir. This was a beautiful wild area. Wildfires in Glacier forced a change in our travels but this was easily done as the owner has a large selection of guide books and maps in the unit. The unit itself is like a hunting cabin, a bit rustic but very comfortable. The smoke in the area was evident in the cabin at times so we had to keep windows and doors closed. On the last evening the owner came by and we asked for a fan to circulate air. I should have done this sooner. We only got to see an outline of the nearby mountains due to the wildfire smoke. A return to Glacier will be earlier in the summer before fire season! We spent most of our time at Glacier Park but always had coffee on the deck and watched the fish jump! Amazing view of the river! And there was even a fishing pole for our son to use! Even though the owners are above .. we never met or saw them and hardly heard them! Relaxing little place!! Dieses Ferienhaus befindet sich auf einem schönen, sicheren ruhigen Straße, zu Fuß zum Supermarkt, Cafés, Souvenirläden in Hungry Horse, die 10 min ist. In den Glacier Park. Es ist schön mit einem schönen Hof, um Grill landschaftlich, zu sitzen und zu besuchen und entspannen Sie in der Hängematte mit Blick auf schönen Flathead River. Der Blick auf Great Northern Mountain ist atemberaubend. Beobachten Adler fliegen durch. Dies ist eine große Straße nach schlendern. Hungry Horse Reservoir Damm ist nur wenige Minuten entfernt.